A selection of quality dog grooming tools are essential if your Cocker Spaniel is to look his best! Learn what's available and how and when to use the different brushes, combs to help you groom your pet so that he looks like he's just left the grooming parlour! Do You Plan To Show Your Cocker? If you do, I recommend you have his coat hand stripped and lightly trimmed by a professional groomer. Before choosing your groomer check that they have enough experience of grooming Cocker Spaniels for showing purposes, and that they're experienced enough to hand strip your Cocker's coat. This is very important if you want to show your Cocker Spaniel! 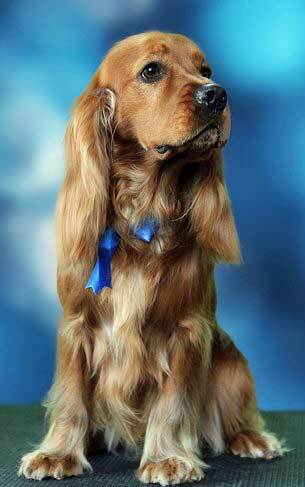 If your Cocker is your family pet and you have no intention of showing him, armed with a good selection of dog grooming tools and the determination to get it right, you should be able to keep him looking just as attractive as those in the show ring! Brushing and grooming your dog is the easy part; it's the trimming and cutting that may prove a little tricky for the novice, but you can very easily learn to do the basics yourself. Rather than jumping straight into it you may want to take your dog to a professional groomer for the first time. Stay with him and watch each step carefully. Makes notes and don't be afraid to ask questions if you're not sure of something. Having watched your Cocker being groomed you may feel confident enough to try it yourself next time. And don't forget, the more you practice the better you'll become at cutting and trimming - practice really does make perfect! If your Cocker Spaniel is still a puppy you'll only need a few basics at first, for example, a small soft bristle brush and a metal comb. When your puppy's coat begins to develop feathers, you can then move on to some of those items listed above. Dog brushes may have widely or closely spaced bristles and in general can be used on any coat. Whilst the bristle brush may not be strong enough to penetrate deep into your Spaniel's long coat, if it's used along the back of your dog it will create a beautiful shine to his coat. A soft bristle brush is the ideal piece of dog grooming equipment for a young puppy as it's very gentle. Using this type of brush on your puppy each day will help to acclimatise him to the different brushes and combs that will be used during the grooming process once he's older. The metal pin brush is ideal for the Cocker Spaniel as the pins can penetrate deeper into the coat. The pin brush helps to remove dead or loose hair from the silky top coat, but it can also comb out the thick (almost cotton wool-like) undercoat at the same time. If you're going to use a pin brush, buy one with rubber tips so that you don't accidentally scratch your Cocker's skin as a result of over-enthusiastic brushing. The rubber tips will also help to improve your dog's blood circulation below the skin. Slicker Brushes: One Of The Dog Grooming Tools Around! 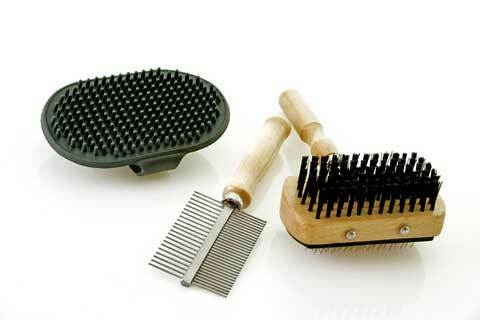 Probably the most popular of the dog grooming tools is the slicker brush. It has very thin metal-wire tines which are slightly hooked over at the ends. The tines are set into a foam or rubber base to allow them to give a little, which is ideal as it's very easy to exert too much pressure on the brush. Even so, when using a slicker brush on your Cocker Spaniel always brush gently to avoid scratching his skin and causing slicker burn. Slicker brushes are great for helping to untangle knots and matting, for removing dead hair, and if used regularly, they can help to reduce shedding (if you're unlucky to own a Cocker that sheds a lot!). The slicker brush can also be used for smoothing the coat after grooming with a pin brush. This brush may be used on any coat; however, they work better on longer-haired coats, and curly or silky coats; that's why they're ideal for grooming Cocker Spaniels. Steel combs very popular and are one of my favourites. I usually use this AFTER I've used a pin brush and/or a slicker to remove tats. You can see the one in the photo has teeth that are evenly spaced, with a line of shorter teeth in between. The wider part is used to remove dead hair on the top-coat and for helping to remove loose and dead hear from the undercoat, which if left behind would cause matting. The bottom, more closely set tines are for any dead hair that may have been missed the first time. 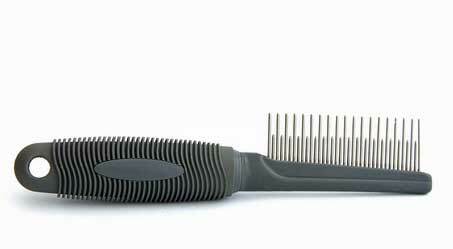 However, if you prefer, you can buy two separate combs: a wider-toothed comb and a comb with closer steel tines. Use the wide toothed comb first, then follow up with the closer toothed comb. The de-matting comb is ideal for teasing out mats in your Cocker Spaniel's coat. They break up matted fur and can help to thin out undercoat and excess hair. Brush your Cocker Spaniel's coat to loosen mats as best you can. Split the mat into strips and place the comb under the mat and make sure the sharp edges are facing away from your dog's skin. Hold the mat at the top, near your dog's body (so you don't pull your dog's skin) and slowly 'saw' the mat. Use a comb to comb out the loose and dead hair. If you prefer, you can use a coat conditioner to help loosen the hair. De-matting tools work pretty much in the same way; they all help to break up a mat. Whilst a de-matting comb is probably easier to use, a mat breaker is an invaluable tool for breaking up those mats that can't be combed out with a de-matting comb. The mat breaker slices the mat into strips so that each section can then be worked on with a comb or slicker brush. If you don't have a mat breaker, or you simply want to save money, you could simply cut the mat into strips with a sharp pair of scissors. Just be careful not to cut right up to the base of the mat as you may cut your pet's skin. A grooming glove is a brush that you wear on your hand, like a glove, for grooming your Spaniel. It has soft rubber bristles on one side, and has short wire bristles on the other. The rubber bristles loosen the dead hair and the wire bristles remove it. If you're hand-stripping your Cocker Spaniel's coat, you'll need either a rubber glove, or rubber thumbs (as seen used in banks to help count notes). The rubber thumb will help you to grip the hair between your finger and thumb to make hand-stripping easier. If you're not going to use the finger and thumb method of hand stripping to remove the excess of soft hair on your Cocker's head, you could use a stripping comb to give a smooth finish. The Cocker Spaniel coat may show cut marks where ordinary scissors or clippers have been used. These marks can be greatly reduced simply by using a stripping comb. Dog fleas and ticks not only cause your Cocker (and you!) much irritation, but they can also affect your pet's health so it's important to check his coat regularly for signs of fleas. Flea Combs have very closely spaced teeth and are used to detect and remove fleas in the coat, but you won't need to use one if you regularly give your pet flea treatment as recommended by your vet. A good pair of cutting scissors, around 7 or 8" long, may be used to keep your Cocker's hair under and around the ear canal neatly trimmed. You can also buy shorter scissors with rounded ends for trimming areas on and around the face so that the rounded edges won't harm him should he move suddenly. Another useful tool is the thinning scissors (sometimes known as thinning shears) which are used primarily for thinning out heavy coats in summer to help your pet stay cool. When thinning the hair on ears, take care not to nip the sensitive folds of skin at the top of your Cocker's ear. Thinning scissors can be used to thin out excess hair on the neck under your Cocker Spaniel's ears, which needs to be kept neatly trimmed if matting is to be kept to a minimum. Keeping the fur trimmed here also helps to get the air circulating around his ears and can help to combat bacteria and ear infections. And the good news is that thinning scissors can give a smooth hand-stripped look! Now that you're familiar with some of the dog grooming tools available, and how to use them, it's time to put them to work and learn more about brushing your dog.